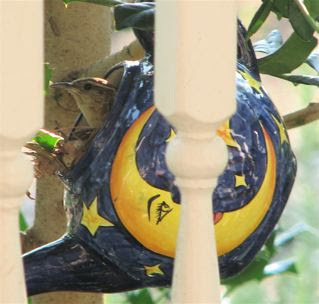 I read an article somewhere awhile back that mentioned a lady who gathered old tea kettles from yard sales and friends to hang around her yard for birds to nest in. Apparently the shape is well favored and they were well used. I bet any Carolina Wrens she may have will enjoy them since we've had them nest in just about anything. This seems quite an appropriate abode since their loud call is described as sounding like it is saying "tea-kettle tea-kettle tea-kettle." Male Carolina Wrens call all year round and we enjoy having a wren on our deck post belting an operetta into the air waves. The volume is incredible and one of my neighbors, although not interested in birdwatching, knows this little bird with a big voice. 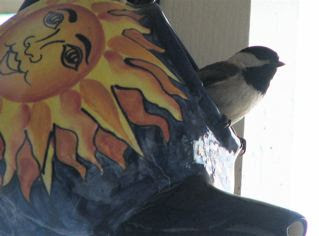 We hung one out in early spring and a pair of Chickadees checked it out but didn't choose the spot for nesting. I figured it was too out in the open so I moved it to a dense shrub. 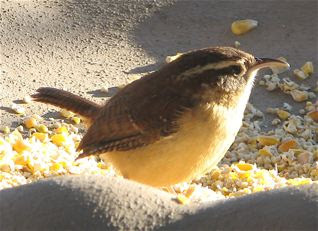 Not long after it was placed in the new location a Carolina Wren began building a nest. The males build the nest. I was very excited since it was going to be easy to watch this family raised at eye level from the window. However, Mrs. Wren never had a chance to move into the teapot. Matter of fact, the "for birds only" memo didn't get out to all the wildlife. 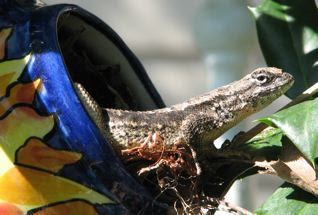 The dominant resident turned out to be an Eastern Gray Fence Lizard who fell in love with the furnished house provided by Mr. Wren. This lizard lays 3-16 eggs in the spring or early summer. They like bugs and spiders and will often climb a tree to hide on the opposite side of the trunk, circling if necessary to avoid being approached. This female (I assume due to the coloring) didn't back down for a moment, so I wondered if there were eggs in the teapot. It was during mating season, but I didn't want to disturb her to look. When I tried to glance in later, it was very hard to see anything with all the nesting materials. Since they bury the eggs in debris, I would've had to dig up the nest and I wasn't going to do that.